Despite the seriousness of the subjects in GATV where would we be without a humour and satire? Afterall we are on spaceship mother earth not just to learn but to enjoy ourselves, smile, have fun, love each other lots, and not worry the days away !!! Bill Hicks is a favorite comedian of mine. His material literally covers all the topics on this site. I pre warn all readers / listeners his language could be thought of as coarse which for me adds to the rawness of his act. He died in the mid 90´s but his legend lives on, his work becoming ever more relevant as his new audiences become more aware. He was without doubt a man before his time. I attach a trailer for a film recently released on his life (click here for full film) as well as many short excerpts of his work. 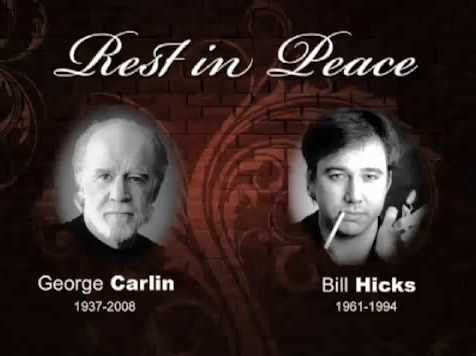 Another great comedian, George Carlin who died a few years back is feature lower down.